Whether you are wearing a bummy pair of Old Navy jeans or a $1,400 pair of Balmain distressed jeans from Barney’s, your belt will make a defining statement. If you have a belt that’s reversible, that’s even better as you can wear black on one side and brown on the other, making those your signature colors. 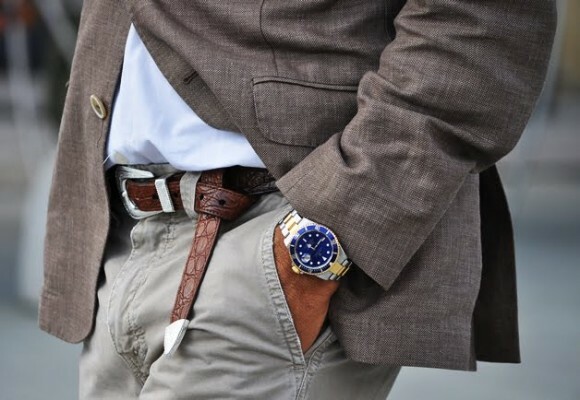 Deciding whether you want lizard, faux croc, leather or pleather is up to you, but make sure your belt is in great shape. If it’s frayed in any way, throw it out and invest in a better belt. For a signature look, check out Gucci belt buckles or Hermes. If you can’t afford to shell out $1,200 for a designer belt, buy the buckle on Ebay for under $200. Your watch is another investment piece for your wardrobe. Don’t buy that $20 Geneva that you saw being sold outside of the bodega or your local flea market. Instead, do buy a Tag, Baume & Mercier, Wittnauer, Patek Philippe or Movado. These are classic watches that never lose their style. Buy silver with gold and you’ll never have to worry about not matching your cuff links again. If you can’t afford the price tag for the top name brands, go online and check out sites like Amazon . Also consider buying a sports watch which can be an Apple, Swatch, Reebok or any other type of watch that you can wear day-to-day, to the gym, etc. Check out some other great watch options here. Here’s where it can get a little tricky. With some styles, tacky-chic is in. Suede saddle shoes are back, $1,400 Paul Stuart lace ups and no socks are making a bold fashion statement, and classic wing tips are always in style. The main point with shoes is the upkeep. Don’t let your heels be uneven and always keep your shoes polished. If you can’t afford a weekly shoe shine, buy a polishing kit for under $15 at your drug store and shine your own. In regards to sneakers and running shoes, depending on the type of athlete or fitness guru that you are, you should change your sneakers every year, but if you run regularly, it may be more like every six months. This is where the boys are separated from the men. Classic elegance comes in a dress shirt that is fitted for you and it can be custom made or tailored to your build. Keep in mind that if you get your shirts and suits fitted in the summer when you’re lean, you’ll likely have to get them let out in the winter after all that holiday feasting. Buy the best quality dress shirts that you can afford. Look for Thomas Pink, Joseph Abboud, Charles Tyrwhitt and other top brands. As it relates to finding the right suit, you can find high end brands at Nordstrom, Neiman Marcus or Saks. Look for Brooks Brothers, Hugo Boss, or Armani. You can also find quality suits at the Men’s Warehouse or Jos. A. Banks. The main point about suits is to have them custom fit to your body. A tailor might charge $20 to re-hem or refit a jacket or pants, but make the investment. You’re worth it. Upkeep: Be sure that your shirts have no fraying edges at the collars or cuffs and replace them if they do. Also take note to replace your white dress shirts if the collars and underarms start to yellow. You can also ask your dry cleaner to treat these, but if it continues, ditch them for new, crisp white shirts. Because your wardrobe matters, making wise investment choices with your clothes and accessories is important. It makes a statement about the quality of the designers that you wear, as well as the upkeep that you put into taking care of you, and it’s a wise investment!